A few weeks ago the Clemson Tigers came to town! I have been hoping all year they would make it to the ACC Championship since it was here in Charlotte and because I wanted them to have a great season of course. We made a whole day of it by tailgating several blocks from the stadium. With an 8pm game there was time to tailgate all day prior! We had great food all day - muffins, fruit & dip, cheeseball, salsa ranch dip, hamburgers and hot dogs, smore bars, chips, pulled pork, potato salad, pasta salad, brownies, cookies, peanut butter balls, and probably some other stuff I can't remember haha. It was quite chilly that morning but at least the sun was shining! Celeste got to stay with us for the weekend. We missed the rest of the Tilly 920 girls! ﻿Family shot before adding all our warm layers. And we were off to the game. The Duke Energy building was lit in orange and purple :) Guess they are partial to Clemson and that is okay by me. ﻿We had great seats in the lower bowl behind the Clemson end zone. ﻿All decked out and staying warm. ﻿This is seriously my favorite hat ever. I pinned it on pinterest and told hubby about it so he just bought it for me as a surprise. He is so sweet! ﻿I somehow captured an awesome action shot of one of the touchdowns! A victory for Clemson!﻿ Finally after a few recent game setbacks we showed up to play like we did earlier in the season! Orange bowl woohoo! Bottom line: fear the tiger! I am pumped the Championship is going to stay in Charlotte for the next couple years... perfect location, hope we can make it again! I found this recipe here and it is super simple! This is the 2nd year I have made this and it is great for gifts or to put out at a party. 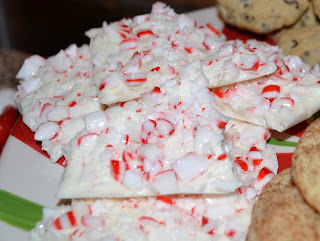 Put peppermints into ziploc and crush - I used a wooden mallet. Melt chocolate chips in microwave bowl on level 7 in 30 second increments stirring in between until melted and smooth. Add peppermint extract to melted chocolate. Put peppermint pieces into strainer over the chocolate so the tiny crushed pieces fall through (the larger pieces will be used later). Pour into wax paper lined 11x7 (or something close to this) dish and spread with spatula until even. Sprinkle larger peppermint pieces on top. Let harden for couple of hours or overnight. Then break into whatever size pieces you wish. Some of it looks fabulous on my Christmas stand! I have a cheap and easy Christmas DIY project that looks like you bought it somewhere.... a wooden snowman made out of a stair rail!! Katie and I found this on pinterest and decided to make our own. Here is how my snowman turned out. Here is how you can make one of your own. Except for the wood pieces, I had everything on hand and I'm sure many of you do too... so the supplies ended up being less than $10! There are 2 different decking stair rails to choose from. I had a craft day one Saturday morning and Katie and Danielle came over so we could each make one. On the opposite end, screw in the other square end piece for the snowman stand. Paint this piece white. Paint the snowman face. I used a sharpie marker for the eyes and mouth and an orange paint pen for the nose. The girls snowman faces all turned out unique. Later Katie painted over her nose and added a wooden nose using the end of a wooden skewer which is another idea. Paint the other square end piece and the piece you cut off for the hat with black paint. Screw the black end piece to the top of the snowman. Use wood glue to attach the black snowman hat piece that you previously cut off to the top of the black end piece. Tie your fabric scrap around the snowman's neck area. Do snowmen even have necks? Regardless we know they need a scarf! Finally, glue the button on in the desired spot on the snowman. AND your snowman is complete!! I put mine on our front porch to merrily greet people at the door. He is just fabulous don't you think?! So go make one and let me know what you think. These would make great Christmas gifts too! I made one for my work executive who had a Christmas party for our team.